This section describes how to configure vault notifications using the Amazon S3 Glacier (Glacier) console. When you configure notifications, you specify job completion events that trigger notification to an Amazon Simple Notification Service (Amazon SNS) topic. In addition to configuring notifications for the vault, you can also specify a topic to publish notification to when you initiate a job. If your vault is configured to notify for a specific event and you specify notification in the job initiation request, then two notifications are sent. Select a vault in the vault list. Select the enabled in the Notifications field. 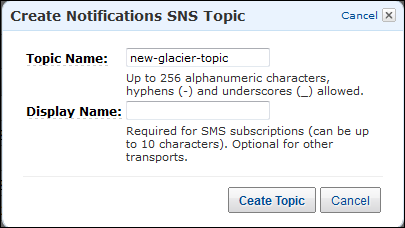 Specify an existing Amazon SNS topic Enter the Amazon SNS topic in the Amazon SNS Topic ARN text box. The topic is an Amazon Resource Name (ARN) that has the form shown below. You can find the an Amazon SNS topic ARN from the Amazon Simple Notification Service (Amazon SNS) console. Click create a new SNS topic. A Create Notifications SNS Topic dialog box appears. In the Topic Name field, specify the name of the new topic. If you will subscribe to the topic using SMS subscriptions, put a name in the Display Name field. The Amazon SNS Topic ARN text box is populated with the ARN of the new topic. Select the events that trigger notification. For example, to trigger notification when only archive retrieval jobs are complete, check only Get Archive Job Complete. By default, a new topic does not have any subscriptions associated with it. To receive notifications published to this topic, you must subscribe to the topic. Follow the steps in Subscribe to a Topic in the Amazon Simple Notification Service Getting Started Guide to subscribe to a new topic.